The residence is located in the heart of a beautiful park, south facing, only 200 meters from the sandy beach and 2.5 km from the nearest shops. The apartments are part of small houses, you will find apartments with two rooms for four people and apartments with three rooms for six people. These are fully equipped including a kitchen corner with ceramic stove, microwave and dishwasher, a bathroom with shower or bath and toilet, television for a fee and a terrace or patio. 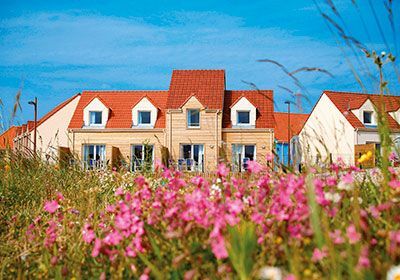 Crotoy is a resort at the mouth of the beautiful Bay of Somme. The long sandy beach and the small fishing port offer a quiet charm to visitors in Picardy, under the supervision of nature and the ocean. It is a city with beautiful landscapes that inspired people like Jules Vern and Toulouse Lautrec. A seaside resort such as Le Crotoy offers numerous activities based on the sea, and you will find plenty of entertainment for the whole family: boat trips, water sports such as sailing and windsurfing and water skiing, kite surfing and horse riding and hiking, bike paths along the Picardy coast and tennis and fishing. The Residence les Villas de la Baie, just 200m from a magnificent, fine, sandy beach with shops, bars and restaurants around 2.5km away, offers holiday rentals in Le Crotoy situated within small semi-detached houses. The accommodation, ranging from the 1 bedroom apartments for 4 people to 3 bedroom apartments for 8 people, is fully equipped with TV and Wifi (both at an extra charge) and a terrace or a small garden. At your disposal : a heated, indoor swimming pool with solarium, laundry facilities (at an extra charge) and free outdoor car parking (1 parking space per accommodation). As a guest you can use a heated indoor swimming pool with sun terrace, internet at the reception against payment, laundry for a fee and free outdoor parking space, a parking space per accommodation. Bed linen is included in the rent. For an additional fee you can rent a TV that is already in the apartment, a baby package and final cleaning. During the summer period you will find relaxing activities for children: free during the months of July and August - children's activities for children aged 4 to 11 years for five half days per week. You must pay a deposit and tourist tax per day / person on arrival at the location. The deposit will be returned to you upon departure after inventory or by post. The accommodation must be left spotlessly clean, if that is not the case, you will only receive a part of the deposit. Pets are allowed for an additional fee provided they have a valid vaccination certificate and tattoo. The dogs must always be kept on a leash at the residence.